With recipes as simple and quick as this, I just don’t see how you can justify using store-bought cake mixes. Okay, I admit that I’ll use a mix when I’m in a pinch – but I usually goose it up à la Cake Mix Doctor. But I very much prefer baking from scratch, and I honestly believe it doesn’t have to be any harder than baking a cake from a mix! Confession: I wrote an “argumentative essay” in my 8th grade English class. What topic did I choose? 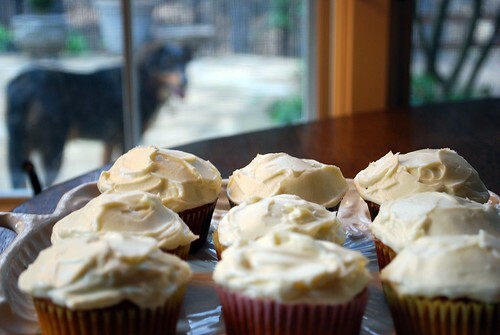 Reasons why people should bake from scratch and not use store-bought mixes. When I presented my topic to my teacher, she was very skeptical. But I ended up with an A+ on that masterpiece. This is one of those recipes that goes right to the heart of my position on this issue. This dump-n-mix recipe for banana cake is incredibly simple, super-quick, and outrageously moist and flavorful. 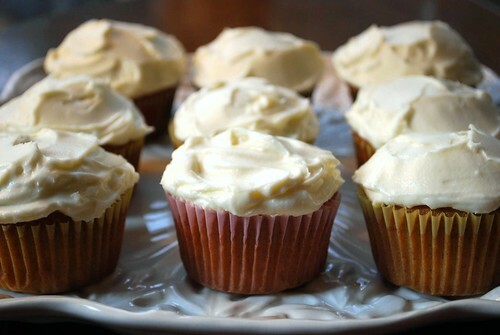 I like to top it off with a classic cream cheese frosting. I usually make this as a layer-cake, but this time I decided to go for some cute cupcakes. On an unrelated side-note, check out the photo below, in which my dog Sophie is making another special Vintage Victuals appearance. Even from outside the window, she knows there are good things going on in the kitchen – especially when I get the camera out! Preheat your oven to 350 degrees. Grease your desired baking pan: either a 13x9x2 inch pan, two 9-inch round layer pans, three 8-inch round layer pans. Or line cupcake tins with liners. Measure all ingredients into a large electric mixer bowl. Blend for 30 seconds on low speed, scraping down the sides of the bowl. Next, beat for three minutes on high speed. 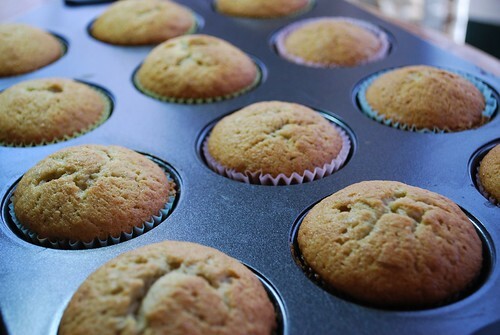 Pour the batter evenly into the prepared pans, or fill cupcake tins about 2/3 of the way full. Bake oblong 45-50 minutes, layers 35-40 minutes, cupcakes 20-25 minutes. Cool completely on racks. Blend together cream cheese and butter. With mixer on low speed, gradually add the powdered sugar until completely incorporated. Add the vanilla, and blend. 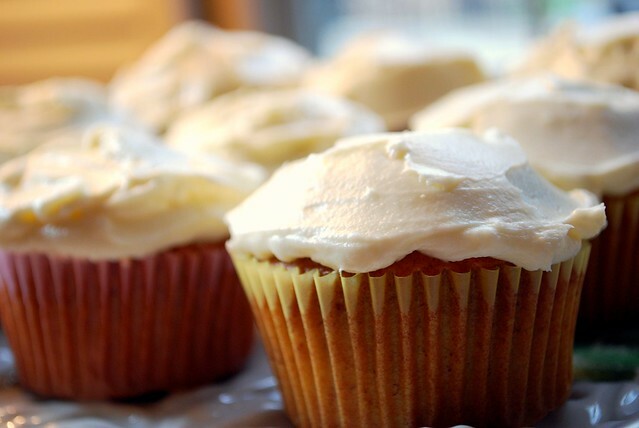 You may add extra sugar or add a little bit of milk to thicken or thin the frosting to the desired consistency.